I got to the computer around midnight last night and had no coherence left. So I chose not to inflict myself on you. Brace yourself for two days' news. I worked long on Friday. The Geriatric Team was scheduled to stay until 6:00 - Charley, Tammy, Connie, and me. And, oh my goodness, were we busy! When I got off I came home, changed clothes, fed the animals, and left for Goshen to meet Jim and Irene. We went downtown for Goshen's First Friday celebration. We wandered town a bit, ate dinner at Mattern's, and had dessert at The Brew. I need to go back when I'm off at 5:00 instead of 6:00. It was tremendously crowded. I ran into Deacon James at The Brew, which was a treat. It was fun. Today was work day. We walked down to Tiffany's at 9:00 for breakfast and a good bit of the town was there. The garage sale was still going and there was an exotic animal sale at the sale barn. They had Nelson's chicken and a bake sale downtown. Jim worked on the garage - got the rest of the insulation and most of the peg board up, and hung lots of stuff up on the walls for me. Irene and I (mostly Irene) cleaned out the flower beds and pruned trees and bushes. Jim and I got the two surviving clothes lines tightened and he replaced the two defunct lines. Irene and I made a recycling run and took lots of stuff to the town compost heap. The town dump day is next Saturday but is only open when I'll be at work, so DeWayne is going to run my three things down with his. I need to get rid of the old space heater - the one that was old when Jen had it in college - an old neon light bulb, and the bottle of mystery liquid that I found in the garage after you died. That will pretty much finish fixing up the garage. Don't worry - there's lots more stuff to keep me busy and out of trouble. When we got finished, I took Jim and Irene to El Zorito. A good time was had by all. They left for home this evening. Jim had offered to help me put in the new water heater today, but I'm dealing with Fibro's Revenge and have felt perfectly awful. So I decided to let him do things I can't do and leave the water heater for me to install. It was a good way to spend a flare day. I was up and active, but I didn't push myself too hard, and it kept my mind off of how bad I felt. As usual, the work done is secondary to the time enjoyed together. 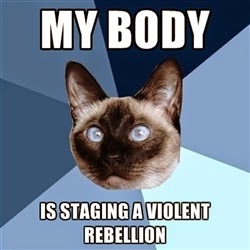 When the alarm went off this morning my body looked at me, reminded me of all I've done this past week, stuck out its tongue, and commenced an armed revolt. My immune system went renegade. I will likely need a crane to get out of bed in the morning. But we got a lot of work done and had a lovely time. Jethro and I are more than ready for bed. He's exhausted, poor creature, after playing with his Uncle Jim. The cats spent most of the week in hiding and are also pooped. We should all sleep well tonight. And, starting tonight, the long-range forecast has our nighttime lows in the 50s and 60s, so the windows can stay open. That will make all of us happy. You should come by and see the garage! And I have most of a red velvet cake with my homemade butter cream frosting - I know how much you love that. It's a good time for a visit. So drop by any time you can. Your little family loves and misses you.